Using the simple slot method, these 3D trees stand on their own, and come apart easily to store flat. One sheet of plywood can make all three sizes of tree. This project would look great in the yard, on the porch, in a store window or anywhere you like! Choose to paint as little or as much detail as you want. Or experiment with a white silhouette to create a Christmas display. Custom sizing available upon request. A spooky tree sets the scene for your next halloween display. Whether in the yard for halloween, on the barn, in a store window or on the wall. A spooky tree sets the scene for your next halloween display. Whether in the yard, on the porch, in a store window or on the wall. Cut from 1/2 sheet of plywood. 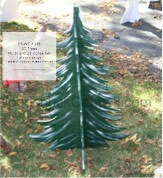 Christmas Tree Yard Art Woodworking Pattern. Christmas Tree Thief! Yard Art Woodworking Pattern. Keep watch of your Christmas tree while this surly, bad-tempered curmudgeon is prowling the neighbourhood. Pattern is 35 x 38 inches tall. When a Christmas tree falls over, the first person you should blame is this surly, bad-tempered curmudgeon who is trying to steal the joy of the season. Pattern is 35 x 42 inches tall. When this surly, bad-tempered curmudgeon is spotted in the neighborhood, you best keep a watch on all the Christmas gifts! Pattern is 35 x 39-3/4 inches tall. Curmudgeon Crafting Christmas Chaos! Yard Art Woodworking Pattern.